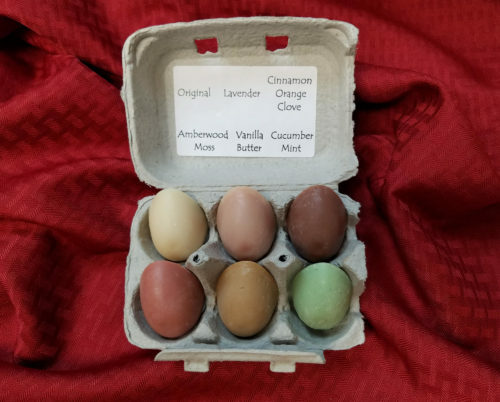 • Soap Sampler shares: six mini-bars per month, one of each scent – packaged in a half dozen-sized egg carton! Third, we have a new, optional, installment payment plan for vegetables shares. 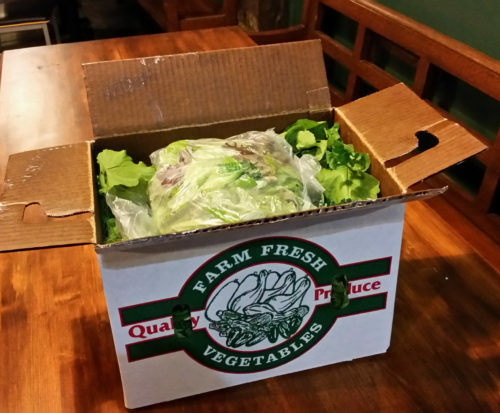 While single payments-in-full are always welcome, we are also happy to accept payments for vegetables shares in up to four installments between now and February 28, 2019. Fourth, we’re offering an Early Bird Special for summer vegetables shares again this year! 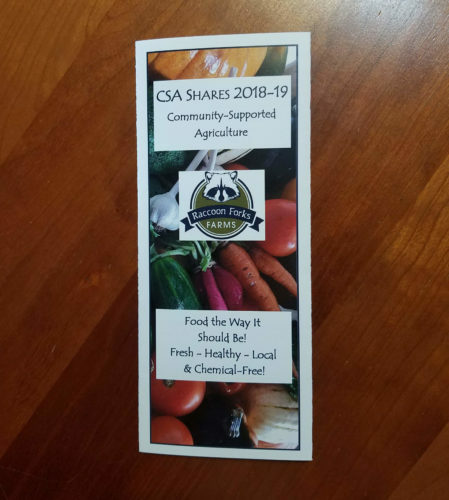 Everyone who purchases summer vegetables CSA shares and pays in full by December 31st, 2018 will receive a free Soap Sampler CSA share! 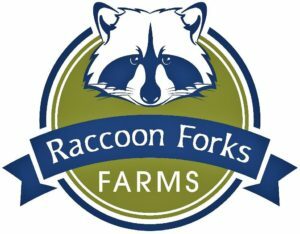 This is a great way to try out our soaps and to support Raccoon Forks Farms by providing the early “seed money” we need to prepare for next year’s growing season. 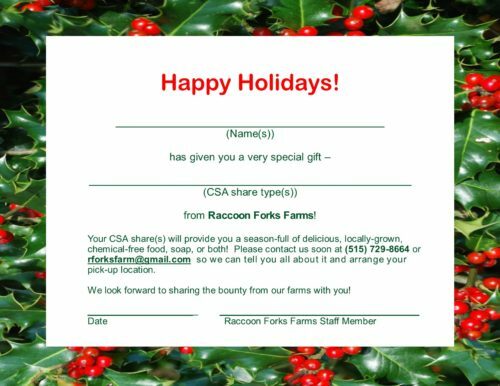 And last but not least, CSA shares make wonderful holiday gifts for those special loved ones! Simply select the CSA share type(s) you want to give, and we’ll provide a pretty gift card to be presented to the recipient. It’s easy, healthy, fun, and truly a gift of love! 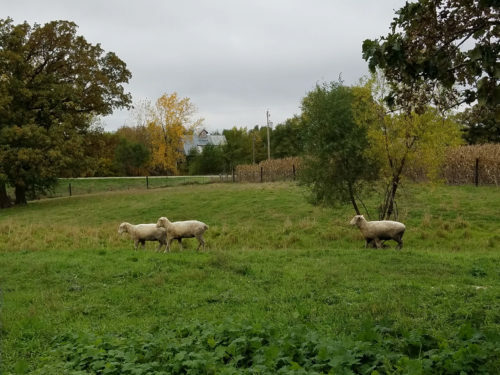 • Call (515) 729-8664 - Please don’t hesitate to call – we always love to hear from you! What’s In Your Vegetables Share? 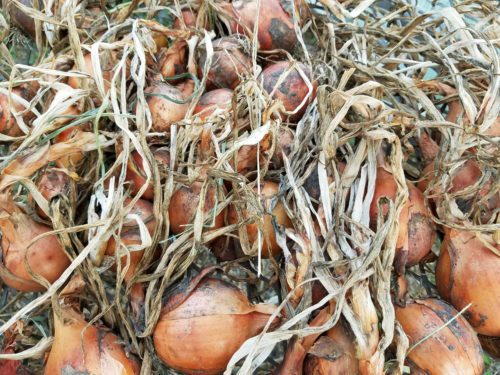 This week, we plan to bring you Brussels sprouts, radishes, carrots, sweet potatoes, butternut squash, garlic, onions, and possibly green onions. Doesn’t this sound like the comfort food we need in this cold weather? 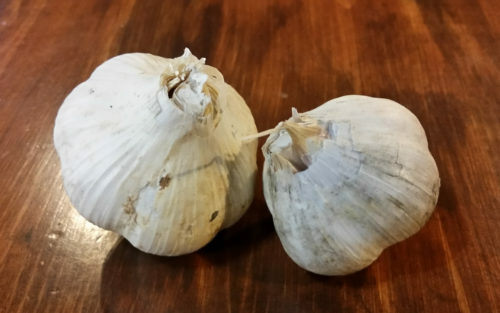 If we are able to include green onions with this week’s CSA vegetables, store them like a bouquet: put them bulb-end down in a glass containing an inch or two of water, cover the tops loosely with a plastic bag, and put the glass in a safe corner of your refrigerator, where it won’t get knocked over. Alternatively, you can wrap your green onions in a damp towel or paper towel, place them in a plastic bag, and refrigerate them that way. Storage for each of the other vegetables we’re sending this week has been discussed in previous newsletters. You can find that information at our produce storage web page! In a medium-sized bowl, combine the grated carrots, garlic, eggs, flour, bread crumbs, salt, and black pepper. Mix well. Heat oil in a frying pan over medium-high heat. Make the mixture into patties, and fry until golden brown on each side. Preheat oven to 375° F. and grease a 9”x13” baking pan with the teaspoon of olive oil. In a large skillet over medium heat, heat the other 2 tablespoons of oil. Add onion and cook until soft, about 5 minutes, then add garlic and cook until fragrant, 1 minute more. Add sausage and cook, breaking up meat with a wooden spoon, until no longer pink, about 6 minutes. Season with salt and pepper. Pour in marinara sauce and bring to a simmer, then add spinach and cook until spinach is wilted. Remove from heat. In a large bowl, stir together ricotta, egg, ½ cup Parmesan, and oregano. Season with salt and pepper. Layer sweet potatoes in bottom of prepared baking dish, slightly overlapping. Spread about ⅓ of ricotta mixture over sweet potatoes, then pour ⅓ of meat sauce on top. Repeat to make two more layers. Top lasagna with mozzarella slices and remaining ¼ cup Parmesan. Cover with aluminum foil and bake until sweet potatoes are almost cooked through, about 45 minutes, then remove foil and bake until sweet potatoes are fork tender, 15 minutes more. Let rest 10 minutes. Garnish with parsley before serving. Cook rice in a rice cooker or on stovetop, using broth, making sure to measure out the amounts of each. Preheat oven to 400° F.
Wash and dice/chop squash, shallots and apples, keeping the squash separate from the shallots and apples. 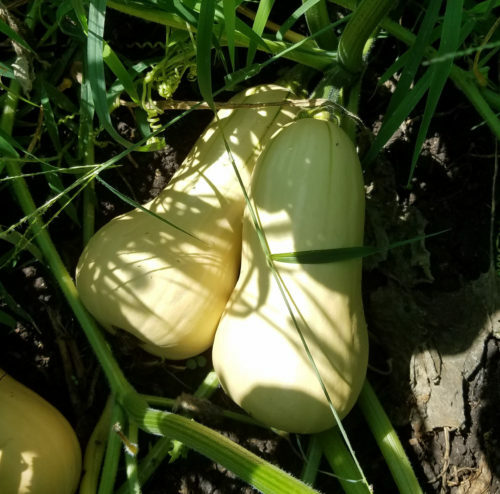 Place squash on a parchment-lined cookie sheet, sprinkle with salt, and roast for 15 minutes. At the 15-minute mark, add apples and shallots to the cookie sheet. Roast another 30 minutes. Set aside to cool. Once cool, put squash, apples, and shallots in a food processor with the thyme and pulse until chunky. Do not purée into a mush or paste. Empty contents into a large bowl. Add the cooked rice and pumpkin seeds to the food processor and pulse until chopped a bit but still chunky. Add to the bowl. Mix everything well. Taste and add more salt if needed. Shape mixture into 4-inch patties, then cook on stove top in a lightly-oiled pan over medium heat for 4-5 minutes on each side or until browning. Make sure to keep the pan covered to help the burger cook throughout. Check every few minutes to prevent burning, should be slightly browned when ready. Let sit for a few minutes after cooking to help burger get more stable before eating. Serve on buns with lettuce and your favorite toppings. Can’t Eat It Now? Save It For (Much) Later! If we are able to send green onions this week, freezing and drying are two good ways to preserve them. Information on preserving the rest of this week’s vegetables has been included in previous newsletters – for ideas and methods for preserving all your produce, see our preserving produce web page!